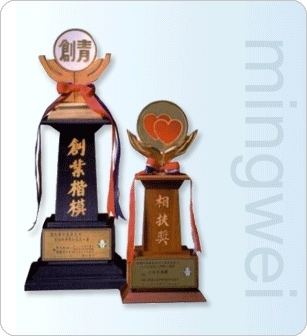 Liu Ming-Chung, Chairman from Ming Wei Company, and his wife, Chang Yen-Hsueh win the 25th award of model of the business creation and supporting. For praising the enterprise who devotes themselves to found business, confers benefits on society, and creates economy boom, proving the model of interesting in creating business, the association had founded the model of election for creating business since 1978. In 1992, we expend the range of election to overseas for making our citizens around the world get the awards. Consequently, such awards become the first awards for praising their achievement. The awards of taking care of people creating business indicates that the best partner takes care of people creating business. Due to their tolerating, forgiving, faithfulness and assistance, such awards could be achieved; therefore, Economy of Taiwan was developed. Those who supporting their partners should be invited to accept the awards. As a result, the award, which was founded in 1986, emphasizes those who help the enterprises creating business.